Denny Jump (Bellevue, WA, United States) on 19 July 2011 in Lifestyle & Culture and Portfolio. At last, the secret is out! Bigfoot not only lives today in modern times, but he has a nephew as well. Just the other day, he was sighted in the Grand Prismatic Pool area, trudging along in broad daylight with his gallant nephew. Little is known about Bigfoot's whereabouts in the past few decades, however, this recent image is proof that the mighty legend is alive and well. To quote Professor Sass Q,. Wacz of Humboldt State University in Northen California, (Prof. Wacz discovered Bigfoot and studied him for years): "This is the most exciting re-discovery and verification of what we have all known in our hearts and mind for years - that Bigfoot not only lives, but has relatives as well. This is just astounding. I am thrilled at this discovery!" Further details will be made available as they are uncovered! (Editor's Note: This image would not have been possible without the assistance of David Jump and Justin Roberge). I see you stayed safe amongst the trees. Smart man! Bigfoot has definitely spotted you! How lucky to catch these rare beings. The nephew looks to be a size 13. Nice processing. @Williams: Bigfoot (played here by my son, David) is 6 foot 3 inches tall.....Bigfoot's nephew, played by my oldest grandson, Justin, is about 5 foot 5 inches now...as this shot was actually taken two summers ago when we were all at Yellowstone....we had a great time!Thanks, Paul! Ha, very well done, Denny! 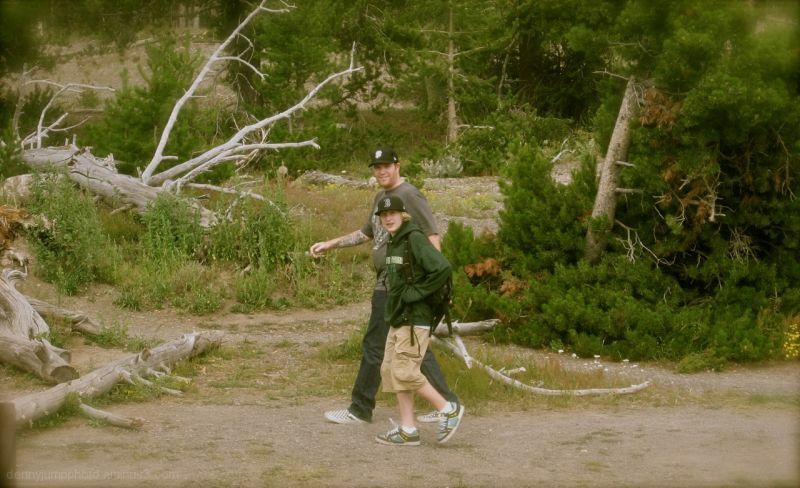 @Jason Politte: Thamnks Jason - The big guy is our son David and the smaller guy is our, now, 15 year old grandson, Justin...this was shot two summers ago in Yellowstone. Too funny, Denny. Happy Silly Tuesday. @B. Thomas: Thanks Barbara -same to you and Mr Al Paca! At first, I thought they weren't hairy enough. Upon closer examination, I realize I was wrong. And, the feet are certainly bis enough. A great shot, Denny. Very funny, great capture...like their expressions! Have a nice day. @RBL: Hi Ruthie ;-) Thank you very much!! A humorous narrative for Silly Tuesday, but a great capture of these two. Looks like David and Justin were having just as much fun. @Steven: They definitely were...David is a crack up with a quick wit ..Justin runs along the same witty lines - they always have enjoyed each other's company! Thanks Steven! This too funny! Happy Silly Tuesday. fake bigfoot sightings get you excited, but you may be on to something here, Denny. Upon closer inspection I see that Bigfoot is getting tattooed now, yes?! @Becky: Their cave was stocked with beer for Mr Big and Sport Drinks for Nephew!